Hi Live, Laugh, Rowe readers! I’m so glad Kelly invited me to be here with you today. 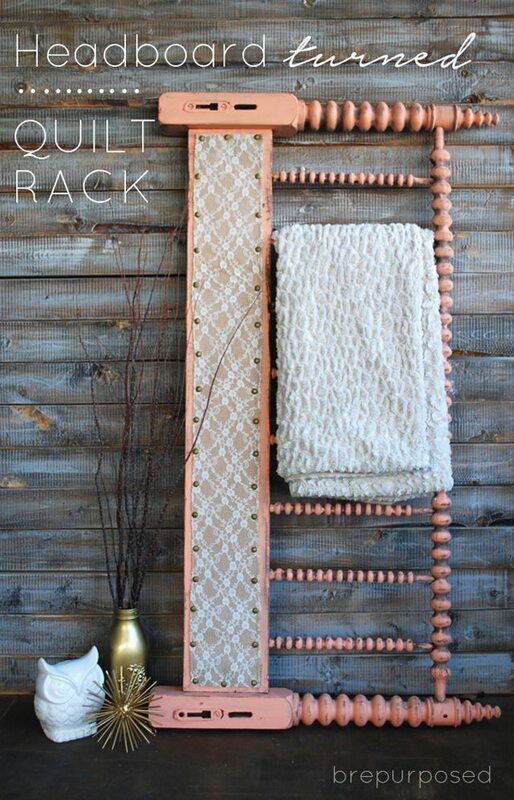 I’m Bre and I blog over at Brepurposed where you can find tons of furniture transformations as well as inspiring DIY and free printables! 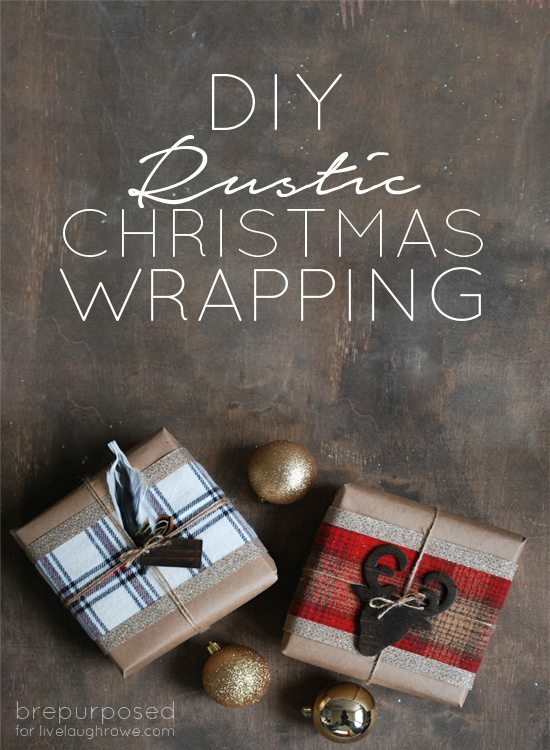 Now I know it’s not even Thanksgiving but you’re going to be wrapping presents before you know it and today I’ll be sharing with you a fun way to personalize those gifts: DIY Rustic Christmas Wrapping. As soon as it starts getting chilly outside, one of my favorite pieces of clothing to wear is a flannel. 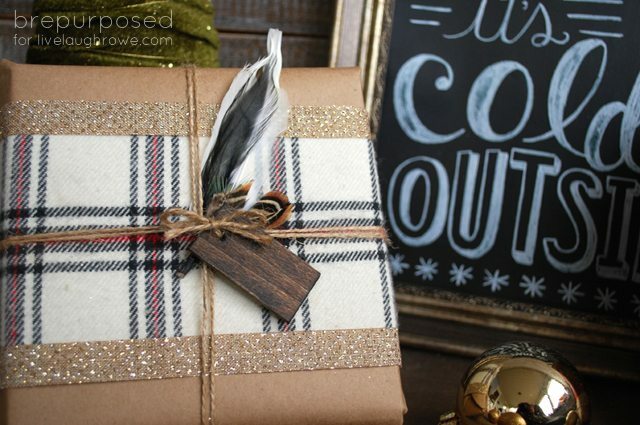 It’s so warm and cozy and the plaid patterns are just so cute, don’t ya think?? So it was only natural that I was inspired to use some flannel for a project. 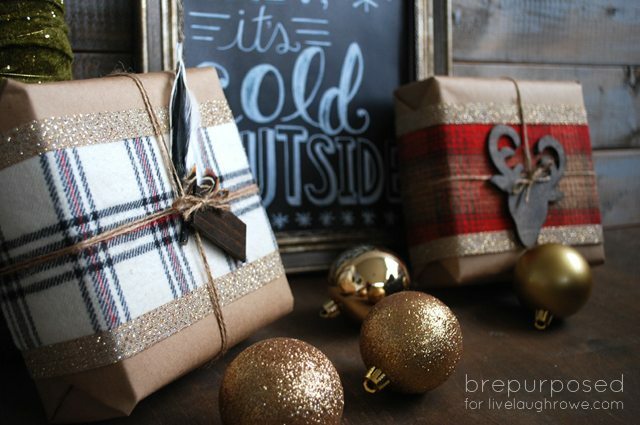 First off, you’re going to wrap your boxes in the Kraft paper. 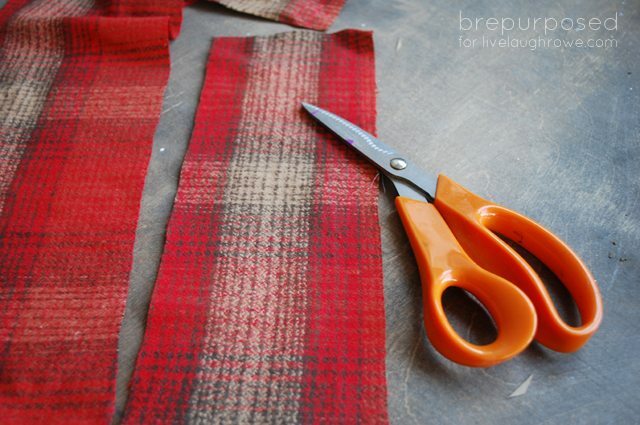 Next up, cut strips of your flannel. 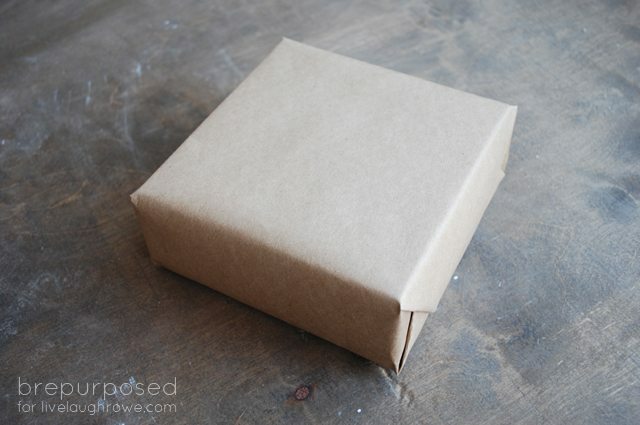 I made them thick enough so you could still see some of the Kraft paper on the top. I used a hot glue gun to attach the fabric to the boxes, only applying it on the bottom of the box where the two ends met. Next up, you’re going to attach your ribbon. Nothing bothers me more than uneven edges of fabric, so I used the ribbon to cover that up and make everything look nice and neat. I used the hot glue gun again, only applying it underneath where the ends of the ribbon met. 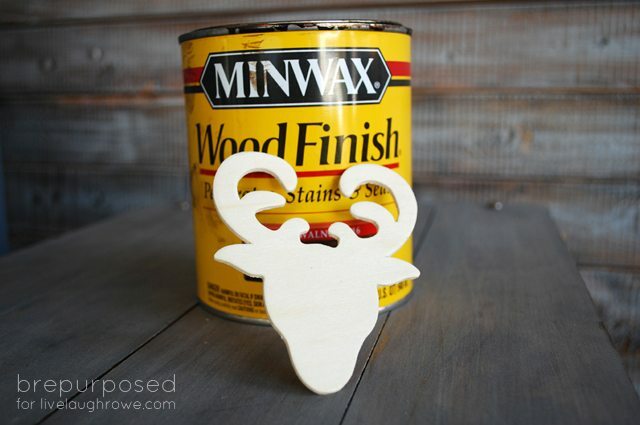 I stained my little deer head using Minwax’s Dark Walnut. I didn’t bother sealing it with anything because it might make it harder to write on. Time for some power tools 🙂 Get your drill and make a hole for your twine to go through. 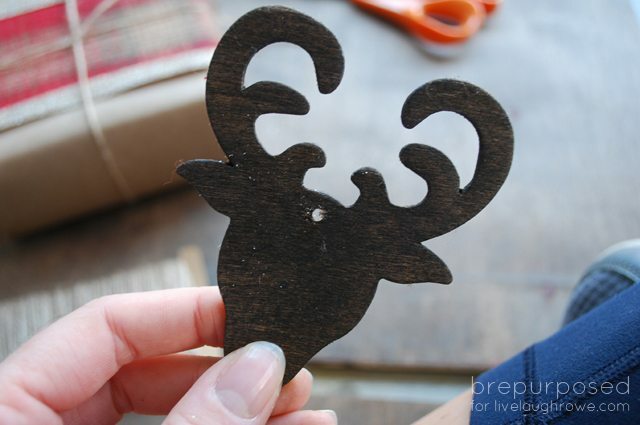 (If you want to avoid having to use a drill, the craft stores sell some little wooden tags with holes in them already). 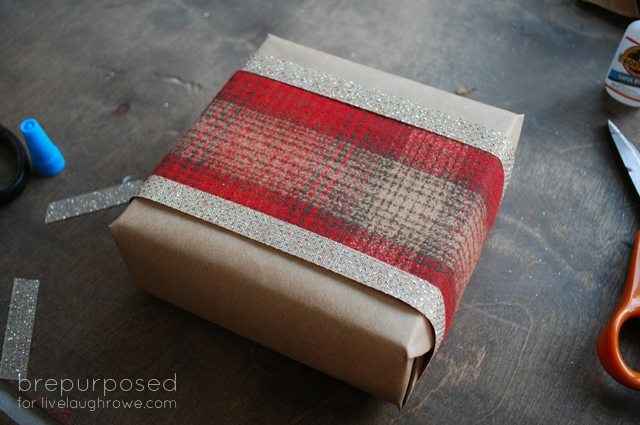 Use your twine and wrap it around your box, using the ends to attach your tags. I refrained from writing anything on them for the purpose of the photos. I didn’t want my ugly handwriting to ruin them 😉 I think some pretty writing in gold would be perfect though! 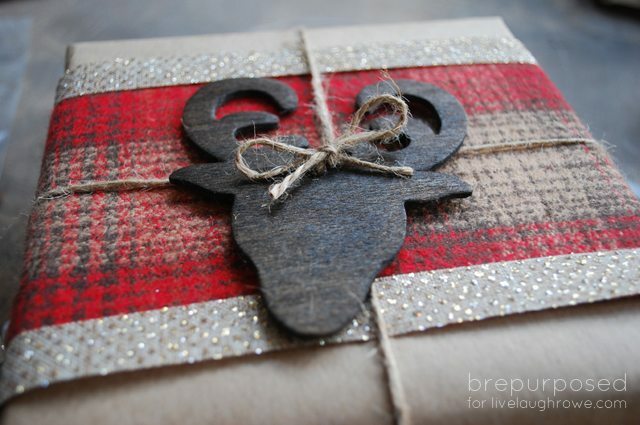 Have you started your Christmas wrapping yet? 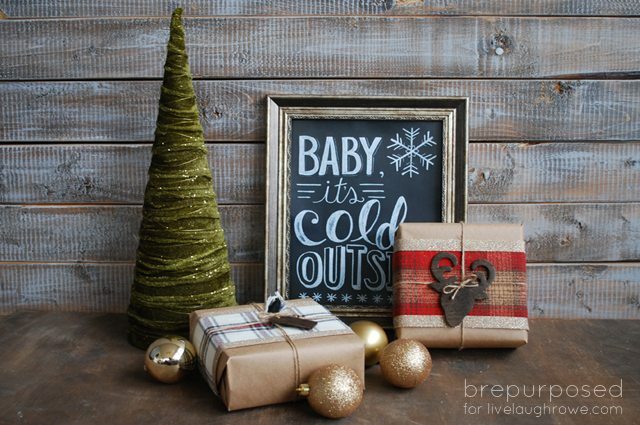 Maybe you haven’t even started your Christmas shopping (I haven’t!). 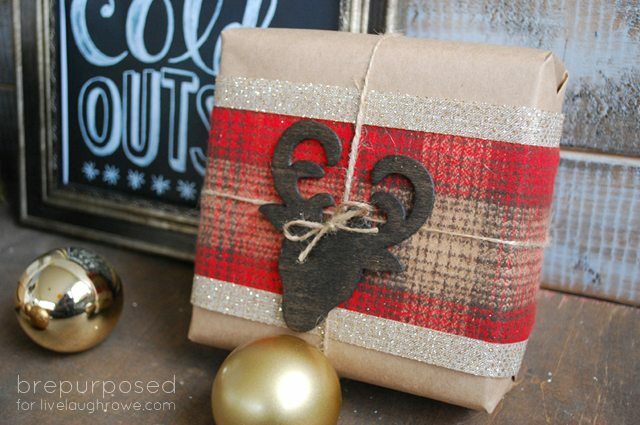 Either way, this is a super easy way to take your gift wrapping to the next level and give an even more personalized present! I want to thank Kelly again for having me today! I think we all wish we were in Italy with her right now, am I right? LOVE these Bre! Brilliant idea to use the flannel!! !